Call us today on 0800 542 0745 or fill out the contact form. Click the button below and we will call you at a time that is convenient with you. Click the button below to call us now. Bird Management Solutions offers a high quality, professional and competitively priced service to solve all your bird proofing and pest bird and related problems. Based in the south of England, we undertake work nationwide in all sectors - commercial, public and domestic. From installation of bird proofing and control measures to removal of bird fouling and contaminated items, Bird Management Solutions can always provide a solution. Call us now on 0800 542 0745 to arrange a free site survey and quotation. Alternatively, you can email us at info@birdmanagementsolutions.com for help and advice on all aspects of bird proofing and control. 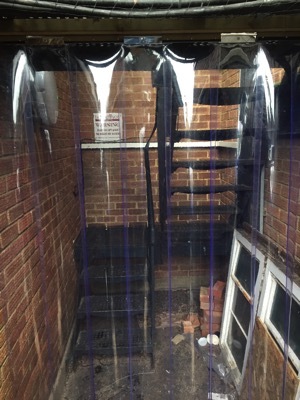 After netting the top of a fire escape, we installed PVC curtain strips to the bottom entrance to stop pigeons from getting in.